Wes Craven (The People Under the Stairs, Shocker) directs this terrifying story of one man's nightmarish journey into the eerie and deadly world of voodoo. A Harvard anthropologist (Bill Pullman) is sent to Haiti to retrieve a strange powder that is said to have the power to bring human beings back from the dead. In his quest to find the miracle drug, the cynical scientist enters the rarely seen netherworld of walking zombies, blood rites and ancient curses. Based on the true life experiences of Wade Davis and filmed on location in Haiti, it's a frightening excursion into black magic and the supernatural. Download The Serpent and the Rainbow in Digital HD from the iTunes store. 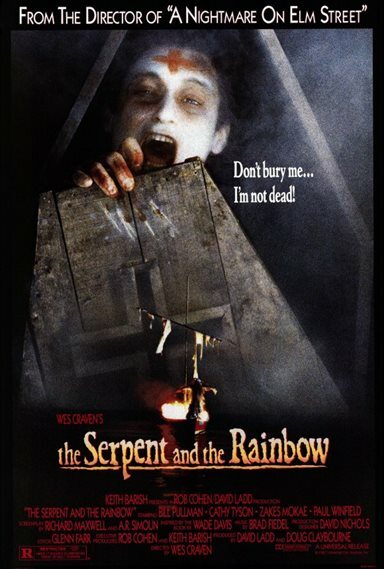 The Serpent and the Rainbow images are © Universal Pictures. All Rights Reserved.